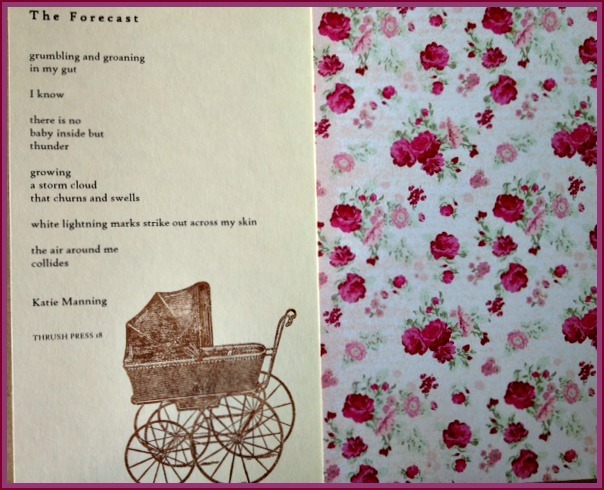 Our Broadsides are laser printed & hand stamped, the back is affixed with artisan, vintage, craft or specialty paper. 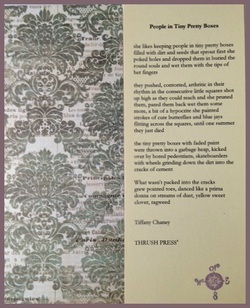 Each Broadside is approximately 3 ½ inches wide by 8 ½ inches high. 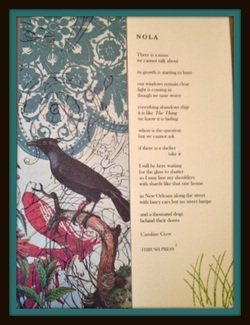 Our Broadsides are a unique piece of handcrafted poetic artwork. We publish an eclectic mix of voices, from the very best work available. 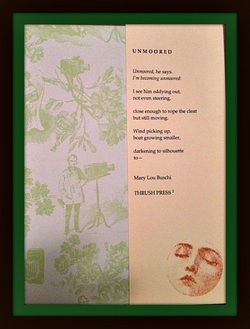 Broadsides are available for purchase at $ 3.50 each. 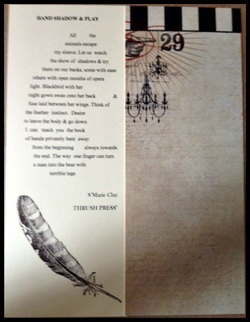 Shipping and handling is free, please allow up to 30 days for your handcrafted Broadside to be delivered to you. 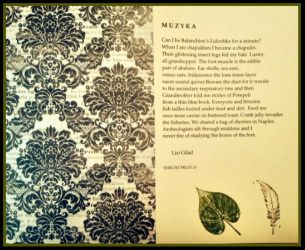 Please indicate which Broadside you are ordering with either name of poem(s) or poet(s), and the number of each desired, in the notes section on Paypal or in an email to hvitoria@msn.com (hvitoriaatmsndotcom). Thank you! "The men here wish to invent a new weather..."
from a thin blue book." this. There is nothing I won’t give back." "The rind from rock, a whiter Cessna stringing itself. Bad sky wish." "under her seat i see her blue purse. and her rosy pink high heels." "white lightning marks strike out across my skin"
"...bright feathers shoulder past the window..."
"shimmering is taught struggle then fading in defeat..."
"I've gone ahead & cut moments..."
"The narrow score of words, his tongued embrace." "In a few summers, they had no need for town." Reeds in the cedar lake. " "they pushed, contorted, arthritic in their rhythm"